The very grippy top surface of the DONIC Akkadi TAICHI ensures maximum spin and rotation to a level never before experienced. This is the reason why so many of the world's top ranked Asian players play with this black rubber on the forehand. Due to its special black sponge the black Akkadi TAICHI is a bit harder and stiffer than the red version.The red Akkadi TAICHI is more elastic and, thanks to its Japanese sponge, produces an even better bounce of the ball. The black version is especially recommended for the forehand. It creates possibilities never dreamt of when serving to open the game and to produce the first top spin in the rally. 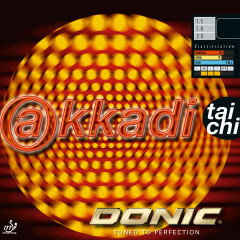 Donic Rubber Akkadi Taichi is beeing added to cart.